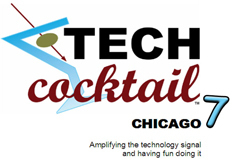 I returned to my hometown of Chicago last week to co-host TECH cocktail Chicago 7. 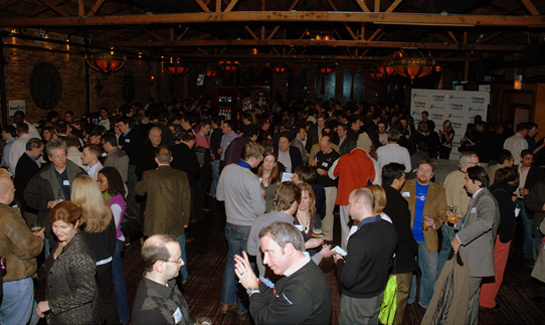 Though the weather was pretty cold in Chicago, the event pulled in about five hundred technology enthusiasts, founders, startups, bloggers and VC's. As a facilitator of the event it is gratifying to see the community come out in such numbers especially with the weather so cold. The evening was kicked off with some TECH cocktail news which included the release of the newly revamped TECH cocktail website and the announcement of the first annual TECH cocktail CONFERENCE. Both of which were conversations points for Eric Olson and I throughout the event but the real focus was on six fresh new Midwest startups that showed off their stuff at the event. ContextMedia is a content solutions for the health care field. Basically, ContextMedia builds patient education platforms that educate and inform patients as they make decisions about their clinical treatment. They showed off their first network, the Diabetes Medical Network, which helps millions of diabetics through interactive patient education at the point-of-care. "Whether you are Bucktown boutique running a targeted promotion of an exclusive women’s clothing line, a Lincoln Park restaurant that seeks to attract more customers on a Tuesday night, or a Logan Square hair salon that wants to call attention to your award-winning stylist, HoodFind is the place to instantly promote your product, service or staff member for local Chicago residents to discover." In the next release later this spring, hoodFind will offer full user-functionality that includes the ability for individuals to post and share "Finds" as well. MetroProper is a localized social networking experience that runs on "Props" which aims to localize citizen media which I previously reviewed. MetroProper showcased its latest release which revamps the user interface and "digg for local listings" approach as well offered a number other community sharing and social media features. PollEverywhere is simple SMS text messaging voting application that you can embed into your presentations or used over the Web. Users can vote by sending text message votes using their cell phones from options displayed on-screen. Embedded polls will update real-time. PollEverywhere costs users to vote anywhere from $3.77 for 50 votes to $32.59 for 500 votes. PollEverywhere is a by-product of Condense, a group of problem solvers, thinkers, and technologists from Chicago who continuously evolve software to meet customers needs. TextAdapt is a performance based online advertising network that offers optimization for publishers to maximize pay-outs for publishers and return for advertisers. TextAdapt takes an unique approach to align the interests of publishers with advertisers and continually adapts to maximize performance. TransFS or Transparent Financial Services is a comparison shopping for small business financial service that launched in December 2007. It is an online comparison shopping service for business financial services (such as credit card processing, P&C insurance, health insurance, payroll processing and business loans). The interface is somewhat like that of Priceline.com. Currently, TransFS only facilitates shopping for credit card processing (the other products will follow later in the year). TransFS looks to help users to find the best service providers without the confusion and sometimes dishonesty that physical broker interaction can cause. Thank you to the TECH cocktail Chicago 7 sponsors which included: Google, Imprint Enterprises, Mullen Law, Chicago Micro, Fiodan, Saper Law, Fitzgerald and Hewes, Hubbard One, Interactive Mediums, Forbes Technical Consulting, LiquidTalk and Sun Trading. Also a special thank you to our event coordinator Paulette and to our event photographer Matt Kuehl who took some excellent photos at TECH cocktail Chicago 7.